Ood Pants, Take 2 | Barbie Who? 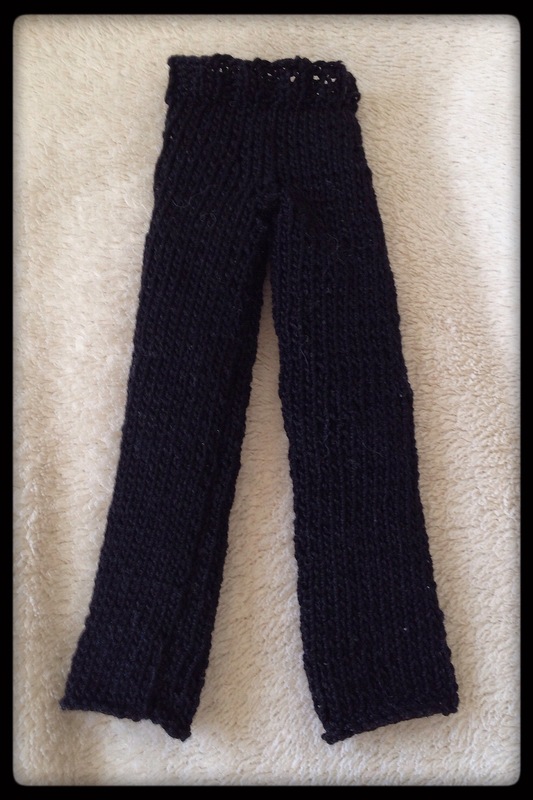 I just finished a knit pair of trousers for one of the Ood dolls to wear. I am tickled pink with how they turned out. Unlike the first pair, they can make it over the shapely hips of the Barbie doll I am transforming into an Ood. They have just enough stretch to get on her, but they’re tight enough that they don’t slide down. They’re exactly what I want for the Ood look. I created this with 2.00 mm knitting needles and black size 10 crochet thread. It took about 12 hours to make this, spread out over several weeks. I created the pattern for this myself because the patterns I found online had a tapered legs and I wanted a straight leg for this pair of pants. I also wanted to experiment with the top of the pants, and I am ecstatic with the finished look. Like any other item I’ve made, it wasn’t always smooth sailing as I created it. Throughout my time knitting this, my cat was being extra cuddly. I had to use a sticky lint roller to de-fluff the pants and the ball (spool? roll? skein?) of thread. I also had to pick out random hairs that had worked their way into stitches with tweezers. It was nice that the cat took a big interest in the project, but it was also frustrating that it added a few extra steps to the process. Also, on no fewer than three separate occasions, I left my work on the couch and my daughter found it. She what any enterprising toddler would do: she started playing with the needles. Luckily she didn’t care much for the thread or the piece itself; she was only interested in the bright red needles. It was cute to see her with them, and at one point it didn’t register to me that she had taken the piece I was creating off of the needle. Luckily she didn’t unravel more than a few stitches each time she did this. I have a hard time getting mad at her for doing that type of thing for a number of reasons, the primary of which is that I am making the clothes for her to enjoy. At this point, playing with the needles gives her more joy than dressing a doll, so I feel obligated to let her have some fun. Another ‘mistake’ I made was to test out a pair of my bamboo knitting needles on one of the legs. I thought that 2.00 mm needles would be the same regardless of what they are made of. Once again,I was wrong. I knit the first dozen rows of the second leg with carbonated single point knitting needles. The needles had a good feel to them and I enjoyed knitting with them. However, I realized that the bamboo needles work the stitches looser than the aluminum needles I had used for the first leg, so it was noticeably wider than the other leg. I didn’t want to unravel all of my work, so I switched back to the aluminum needles and continued creating the pants. You can’t tell that one leg is wider than the other unless you press them flat; it isn’t very noticeable when the doll is wearing it. Can you see the difference? I am not posting the pattern for these knit pants today. I want to make a few alterations before I consider the pattern publishable. Luckily, the changes are fairly minor, so it was easy to write them out (they have to do with sizing and length). I want to make the second pair with the final corrections before I post the pattern just to make sure the changes knit up properly. I do plan on using this pair of pants for one of the finished Ood, so at least you won’t see the blog held up for a week while I make a third pair of pants. I am going to finish the final pair of pants before I move on to another aspect of this doll. There are a variety of things I still need to create for these Ood, and I am trying to tackle them one item at a time. I haven’t decided wether I want to work on the second Ood mask or the first Ood jacket after I finish the pants. I am fairly certain that I want to cut the hair of both dolls before I start on the Ood mask, and that will be an experience in itself. We shall see what comes next…. Until then, I hope you all have a fantastic day! I dunno, I’m kind of digging the tropical Ood look. 😉 This is so awesome that I’m not sure I can handle it at zero-dark-thirty in the morning. Cheers to a fellow crafty Whovian!